Why is Platinum Called the "Rich Man's Gold"? Most have heard silver referred to as the "poor man's gold," but few are familiar with the phrase describing one of the other precious metals, that being platinum: the "rich man's gold." 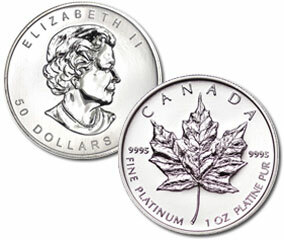 Platinum is significantly more rare than gold, so historically it has commanded higher prices than the yellow metal. Yet none of us read about the "Platinum Rush" in our history books, nor are we inundated with television shows chronicling a group of down-on-their-luck wannabe miners looking to strike it rich digging for platinum. Granted, platinum is not a true "money metal" like its cousins gold and silver and therefore doesn't have the same amount of investment demand, but that doesn't keep platinum from being the most precious metal and perhaps the one with the most upside potential right now. In 2013, less than six million ounces of platinum were extracted from the earth, the smallest amount in over a decade. Compare that to the average annual gold production of nearly 80 million ounces, making new gold supply approximately 13 times more plentiful than platinum on a yearly basis. Additionally, while nearly every ounce of gold ever mined still exists above ground, platinum's main demand comes from industry – primarily for its use in catalytic converters in automobiles – and only a portion of it is recycled each year. As a result, once platinum is put to use, it's usually gone for good. Sure, gold is the more liquid metal due to its substantial standing as an investment asset. It's sought after by numerous cultures, governments, and individual investors because it's the ultimate store of value. But platinum can still be easily bought and sold, just like gold or silver, and there are a handful of bullion products from which to choose. The 1-ounce Canadian Maple Leaf and Australian Platypus are the main platinum items available for retail investment, and there is rumor that the U.S. Mint will resume production of the Platinum Eagle at some point in the not-too-distant future. Additionally, 1-ounce (and 10-ounce) platinum bars offer a slightly lower premium than coins – a good choice for investors looking to get the most physical platinum for their money. 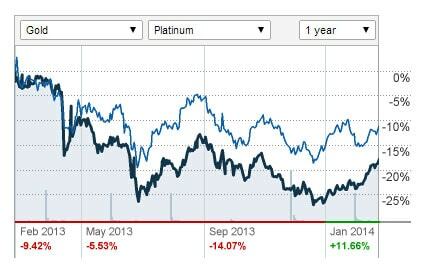 Platinum ended 2013 near $1,400 an ounce, and maintained close to a 10% premium to the price of gold throughout the year. and is set to continue to do so. We're in the midst of a global monetary crisis where every nation's central bank is trying to outdo its neighbors by devaluing its currency. Gold and silver – which have served as money almost since the beginning of human history – are likely to be more sought-after assets to own during a currency crisis than platinum and the other industrial metals. But given the fact that platinum's supply can so easily be disrupted (and routinely is) by geopolitical events such as threats of mining nationalization, labor strikes, energy blackouts, and mine closures in South Africa and Russia (where 90% of the world's platinum is mined), it's safe to say the recent trend of dwindling annual platinum supply will continue. Not only is supply falling, but demand is rising. Notably, Asian demand for automobiles has gone through the roof, and this creates a huge need for platinum. 2013 demand exceeded supply by the widest margin since 1999 – about a 605,000 ounce deficit – according to London-based Johnson Matthey. The deficit could rise even higher in 2014. All the data points to a widening supply-demand imbalance which is expected to fuel a rally in platinum prices over the next 3-5 years. As evidenced by the last major spike in platinum (in 2008), platinum prices have the potential to move violently to the upside once the rally gets going. For instance, platinum advanced a whopping 50% in just three months prior to reaching its apex of $2,300 an ounce six years ago. Yes, it's more speculative than gold as an investment. But platinum carries just a small premium to gold currently and offers a significant opportunity for those looking to diversify beyond gold and silver.